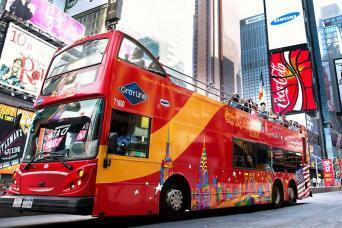 A bus tour of New York is the perfect way to see the city. 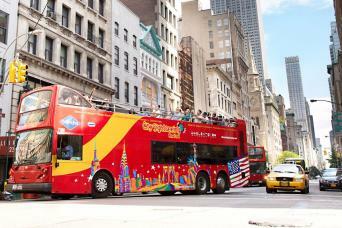 Whether it’s Harlem, Times Square or the Brooklyn Museum, enjoy our best selling New York City Hop-On Hop-Off sightseeing bus tour. Explore New York at your leisure in an open-top double decker bus, with 39 designated stops (conveniently located near the main points of interest), and see iconic attractions such as: The Statue of Liberty, One World Trade Centre, the Empire State Building and many more! Ticket price also includes a FREE night bus tour! 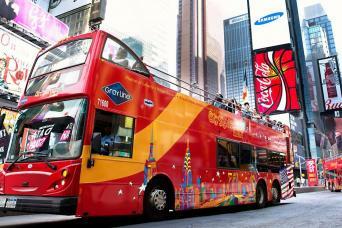 City Sightseeing New York© Hop-on, Hop-off Ferry Tour. Admission to the Museum of the City of New York or New York Historical Society. Unlimited hop-on, hop-off access on Downtown, Uptown, and Brooklyn Tour loops for 48-hours. FREE additional tours, attractions, and savings included in your pass! (As mentioned above). Valid only with initial booking. May not be upgraded from an existing 48 hour All Loops booking. Hop-on and hop-off at your leisure as you discover the best of New York City’s attractions from the top deck of one of our comfortable buses! 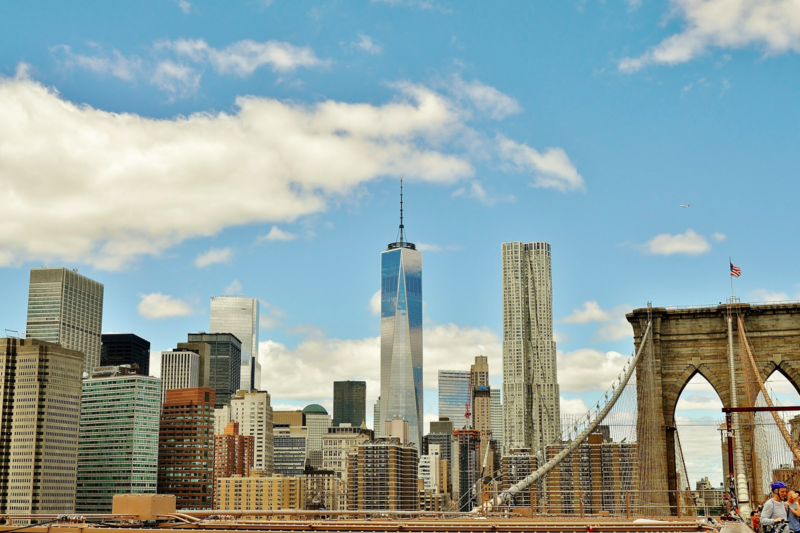 Let our professional tour guides lead you on 4 unique bus loops highlighting the most iconic Big Apple attractions including; Times Square, Central Park, the Brooklyn Bridge, One World Trade Center, and the Empire State Building to name but a few. Want to get out and explore some of New York’s most famous sights up close? No problem! You can hop-off at any of our 39 designated stops, conveniently located near top attractions. Take your time exploring your favorite sights by foot, then catch the next bus when you’re ready! With unlimited hop-on, hop-off access throughout the city, the All Around Town Tour is the ultimate way to experience New York City at an unbeatable price! • Unlimited hop-on, hop-off access at prime locations in Manhattan, and Brooklyn. • FREE Night Tour of the city lights at iconic attractions included. • Ferry Tour of New York’s famous waterways, featuring views of the Statue of Liberty and Ellis Island included! FREE additional tours, attractions, and savings included in your pass! Tour Times: Times vary by tour loop.